The United States and China -- whose differences are fueling fears of a trade war -- are flexing their muscles at the start of a G20 meeting of finance ministers expected to focus on tariffs, tech and taxes. The meeting of the world's leading economies in Buenos Aires comes days before US tariffs on steel and aluminum are due to come into force on Friday for all countries except Canada and Mexico. The main focus of the talks is the threat of a trade war between the US and its trading partners, particularly China and the European Union. And, as with every G20 meeting since US President Donald Trump's arrival at the White House, the drafting of the meeting's final statement has revealed differences between the world's two biggest economies. "China and the United States are each flexing their muscles during the negotiations on the final text of the communique," which will be released at the end of the meeting on Tuesday, a source close to the talks said. "The communique is likely to show that there are tensions over trade." "The text won't look to hide these tension, but it should however underline that a collective solution remains the best option," the source added. The US tariffs are essentially aimed at China, whose steel producing overcapacity has hampered US producers for years, but Washington's European allies have also come under fire from Trump, who has particularly targeted German trade surpluses. In the last few days, Europeans have reaffirmed their unity with the US amid a flurry of diplomatic moves to prevent steel and aluminum taxes leading to a trade war. "Dividing Europe cannot be in the interest of the American government, and it will not succeed," said German Economy Minister Peter Altmaier to the German business daily Handelsblatt before heading to Washington to meet his US counterpart. Analysts said the G20 are not going to resolve differences on trade policy this week, but may be able to find some common ground. "They may agree to work to reduce overcapacity in the steel industry," said Capital Economics in a note, after the issue was reportedly discussed in a meeting at the weekend between German Chancellor Angela Merkel and Chinese President Xi Jinping. However, tensions are further being aggravated by the EU's consideration of a plan to tax the revenues of US tech giants Google, Amazon, Facebook and Apple. 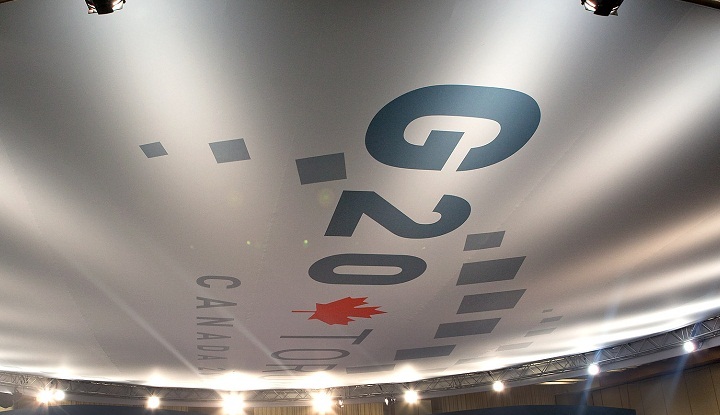 Before the Buenos Aires meeting, G20 members failed to reach agreement on a united way forward, paving the way for unilateral action in the meantime. The European Commission in Brussels will present its own measures on Wednesday in the aftermath of the G20 meeting. France's EU Commissioner Pierre Moscovici sought to reassure Washington in a letter to US Treasury Secretary Steve Mnuchin. "These proposals are neither a response to a French request nor a response against the United States," Moscovici told AFP. "We have been working on these proposals for months, in close consultation with the digital companies, Europeans, the OECD, and our international partners, including the Americans." Nevertheless, Mnuchin issued a hands-off warning on Friday. "The US firmly opposes proposals by any country to single out digital companies." In such a tense context, the final communique will avoid once again any references to "protectionism" and replace it with a more ambiquous committment to resist "inward looking policies."